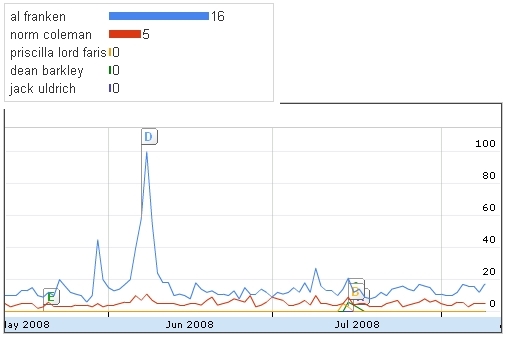 Last week I took a look at the search volume from Minnesotans looking for information on John McCain and Barack Obama. Today, let’s take a look at Minnesota’s US Senate race featuring incumbent Republican Senator Norm Coleman, Democratic challengers Al Franken and Priscilla Lord Faris, and Independence Party candidates Dean Barkley and Jack Uldrich. A comparison of all the candidates using Google Insights for Search reveals, not surprisingly, that Al Franken is by far the most popular search phrase during the past 90 days. The big spike in search for Al Franken information was a result of winning the DFL endorsement in June. Searches for "al franken" consistently outpace searches for "norm coleman", which is likely due to Franken’s celebrity. Democrat Priscilla Lord Faris and Independents Dean Barkley and Jack Uldrich barely register at all, but Lord Faris gets a bump in July when she announces she’ll challenge Franken in the DFL primary, as does Barkley when he announces he’ll enter the race. 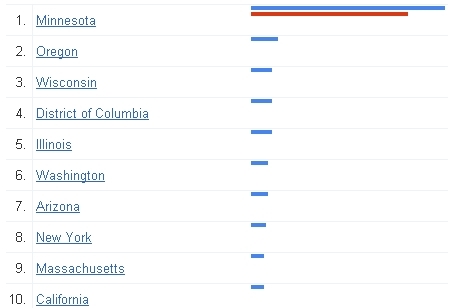 While more Minnesotans are searching for information on Al Franken compared to those searching for information on incumbent Norm Coleman, Franken does attract interest from out of state. Coleman, conversely, has no interest from out-of-state searchers. What these numbers portend is anyone’s guess. The wildcard here is Franken’s celebrity. What we cannot determine is if his lead in search volume indicates interest in his campaign or in him as a famous person. Uh how about people search Franken shocked that a US Senate candidate refuses to pay taxes.